Ann Michele's World: Flowers and Gratitude. I've been having such a stressful time of it lately that I think he intuitively knew I needed a little pick me up, or a little reminder that he was thinking of me. It's amazing how the little things in life, like receiving flowers can bring us so much joy and happiness. What can I say....I'm a hopeless romantic. Flowers, cards, candy, notes, texts that say or show love....yup I adore them. Honestly, any little gift that is given from the heart means the world to me. I'm even happy with little phone calls each day, it's just about doing those little extras. To me those are as water is to a flower, they help to nurture and sustain loving relationships. Lets face it none of us are mind readers, and so it's good to let the ones we love know how we feel or that we are thinking of them. So today call, write, or send the person you love a little something special! Thought I would share this with you too, as a friend had sent it to me and it is filled with little ways to show express love. I thought it was cute. 1. Start each day with a kiss. 2. Say “I love you”. 3. Date once a week. 4. Accept differences. 5. Be polite. 6. Be gentle. 7. Give gifts. 8. Smile often. 9. Touch. 10. Talk about dreams. 11. Choose a song that can be “your song.” 12. Give back rubs. 13. Laugh together. 14. Send a card for no reason. 15. Do what they ask before they ask. 16. Listen. 17. Encourage. 18. Do it their way. 19. Know their needs. 20. Fix their favorite breakfast. 21. Compliment them twice a day. 22. Call them. 23. Slow down. 24. Hold hands. 25. Cuddle. 26. Ask their opinion. 27. Show respect. 28. Welcome them home. 29. Look your best for them. 30. Wink at them. 31. Celebrate birthdays in a big way. 32. Apologize. 33. Forgive. 34. Set up a romantic getaway. 35. Ask, “What can I do to make you happier?” 36. Be positive. 37. Be kind. 38. Be vulnerable. 39. Respond quickly to their requests. 40. Talk about your love. 41. Reminisce about your favorite times together. 42. Treat their friends and relatives with respect. 43. 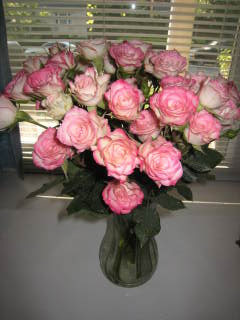 Send flowers every Valentine’s Day and Anniversary. 44. ADMIT WHEN YOU ARE WRONG. 45. Be sensitive to their sexual desires. 46. Pray for them daily. 47. Watch sunsets together. 48. SAY “I LOVE YOU” FREQUENTLY. 49. End each day with a hug. 50. Spend time together with no distractions.